Offices and Shops for Rent - Ken Corporation Ltd.
Tokyo office space listing for rent to start up or expand business in Japan including information and case study by KEN. landmark building to small office. who seek very best location. A central area in downtown Tokyo, Ginza is a bustling shopping and business district with a long history. 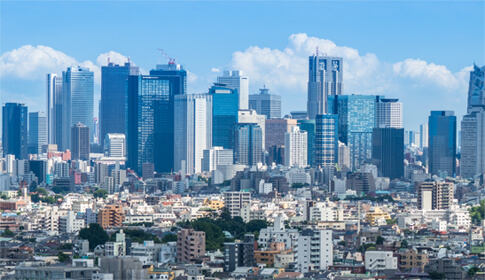 Roppongi is a hub for numerous globally active IT and financial service companies, including Google, Goldman Sachs, and Credit Suisse, which are clustered particularly at Roppongi Hills and Tokyo Midtown. Shibuya is a commercial and business area highly popular among the younger set, and it goes by the nickname “Bit Valley” for its numerous IT-related companies. This area exudes a fashionable, sophisticated image and is highly popular among globally famous clothing, IT, advertising, and design companies, including Gucci and LVMH. Shinjuku is home to the Tokyo Metropolitan Government, a high-rise district, and one of the country’s top shopping districts. Shinagawa Station, one of the stops on the Tokai Shinkansen line, offers easy access to Kyoto, Osaka, and other destinations in the Kansai region. Travelers can get directly to Narita Airport without the need for transfers, and Haneda Airport. The area around Tokyo Station is Japan’s financial and banking heartland. It invites comparison with the City in England and Wall Street in the US. Yokohama has the second-largest municipal population in Japan, after Tokyo. Yokohama Minatomirai 21 is the city’s central business and shopping district. The latest property listings updated within 7 days. in Tokyo metropolitan area and Yokohama. Large, famous building is popular for great working environment. There are some smaller plot for rent is offered. Just one minute from station nearby! Office spaces in Tokyo metropolitan area and Yokohama. Established an office environment that readily enables interactions and exchanges that lead to the creation of new ideas. Facilitated relocation to an office building on an elevated site in a popular area with a good view. At KEN, we offer a wide variety of services, including the establishment of new offices, office expansion and cost reduction, personnel recruitment, personnel relocation for improving morale, and strategic centralization of isolated offices. As a leading real estate agent, we help every step of the way. Simply ask us to show you properties and choose your best living arrangement. You can do the whole process here.